LIFE ABOVE IT ALL. The tallest tower at UniverCity SFU Burnaby master planned community is coming soon to this beautiful neighbourhood. 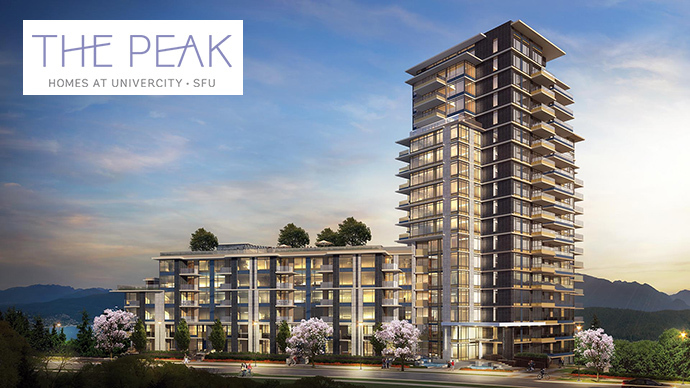 Located in the sought after West Highlands Neighbourhood, The Peak at SFU Condos feature over 10,000 square feet of holistic amenities. Steps from one of Canada’s most prestigious universities, these 1, 2 and 3 bedroom concrete residences offer the most incredible panoramic views in the province at unbelievable value. An impressive opportunity brought to you by Intergulf Homes. 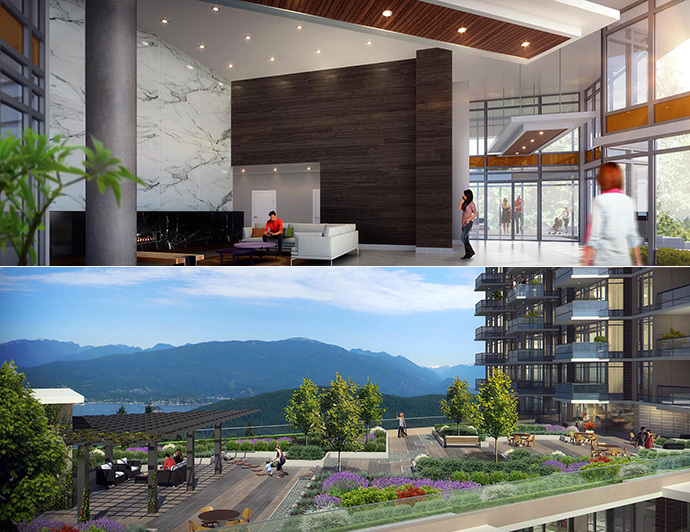 The presentation centre for The Peak at SFU Burnaby condos will be opening at 8955 University High Street Burnaby. 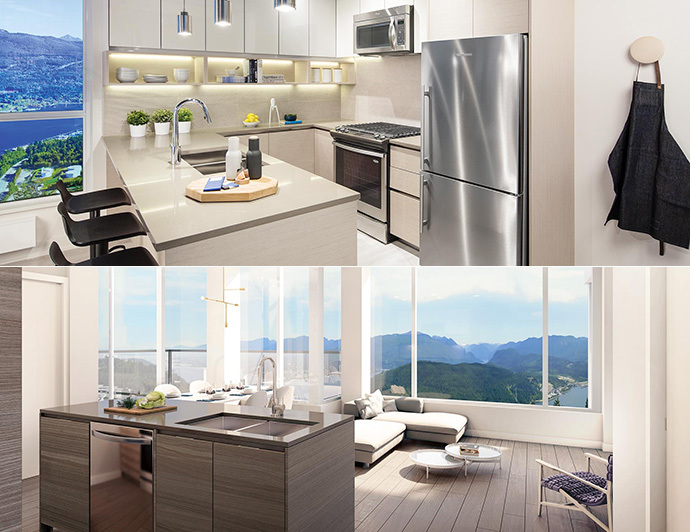 One bedrooms at The Peak SFU condos will start from just $249,900 while the two bedroom suites will start from $365,900. Brought to you by Intergulf Developers, the new UniverCity Burnaby condo tower is a master-planned community where residents can live, play and thrive. Environmental design, beautiful landscaping and stunning architecture andinterior design make for one of the most impressive new developments in the Lower Mainland this year. The SFU Peak Burnaby condos is a 17 storey high-rise tower high atop Burnaby Mountain. From fiery sunsets over the Pacific Ocean to beautiful landscapes of the snow capped North Shore Mountains, there is no better view of the local vistas than from The Peak Burnaby condos. It’s simply stunning. For more information about these new residences, please visit www.peakatsfu.ca today. Located in the most sought after neighbourhood in Burnaby, the West Highlands community is an established area that continues to evolve and thrive. The Peak at SFU condos are located in one of the most modern and urban communities that has been master planned from ground up. The area includes not only one of the top ranked universities in the nation, but also an elementary school, child care facility, shopping, dining and many parks. As well, residents at The Peak at UniverCity SFU will have access to exclusive amenities (both recreational and cultural) at SFU. Tree lined trails, dog-friendly spaces and the Burnaby Mountain Conservation Area are just some highlights of the neighbourhood. Other things of note within walking and driving distance from the UniverCity SFU Peak condos in Burnaby include lawn and picnic areas, children’s playground, view points, Kamui Mintara, Burnaby Mountain Golf Course, the Harry Jerome Sports Centre, Barnet Marine Park and Academic Quadrangle. Not only that, SFU has been consistently ranked as the #1 Comprehensive University in Canada by McLean’s Magazine. 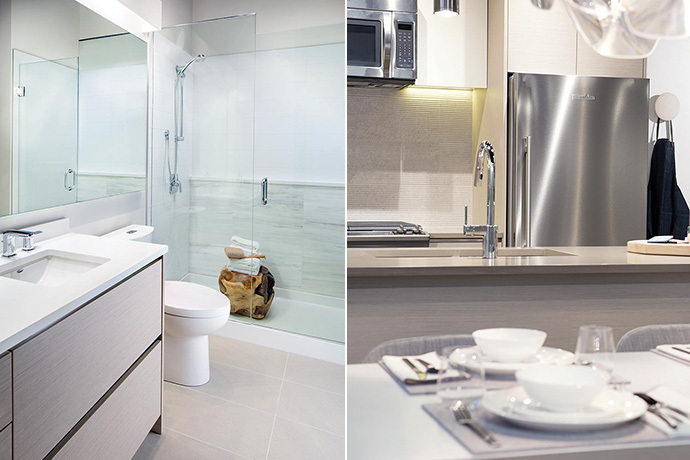 The Peak Burnaby condos are refined and sophisticated when it comes to interior finishes and features. The serene living spaces are defined by beautiful colour palettes, classic craftsmanship and both quality and value that will last for generations. There are two naturally inspired colour schemes for presale homebuyers to choose from. The intelligently designed floor plans at The Peak at SFU Condos will make for spacious and flexible living spaces both inside and out. Open concept living are comfortable and the expansive windows will frame the stunning views. Beautiful wood laminate floors in the main living spaces and kitchens coupled with flat panel modern cabinetry and engineered stone counters are some of the high-end features of these homes. As well, all homes at the UniverCity SFU Peak Burnaby condos will come with stainless steel appliances and large format tiled bathroom floors. Dual flush toilets and insuite laundry (washer and dryer) are also included. One of the first things you will notice when you arrive at The Peak at SFU UniverCity is the stunning grand entrance lobby. The lobby will feature a soaring double height ceiling entrance with expansive windows, comfortable seating area and a marble framed fireplace with contemporary art. The Peak Burnaby condos at SFU UniverCity community will feature life enhancing amenity spaces totalling over 10,000 square feet! There is a Wellness Centre and gym where you will find a two storey room with weight training and cardio equipment in addition to a dedicated yoga room. The Highlands Lounge at The Peak SFU will feature a private dining and entertainment room with chef inspired kitchen that opens onto the most unbelievable Panorama Terrace (a sprawling elevated outdoor space on the seventh floor that provides stunning panoramic views and features an outdoor bbq area). Kids of all ages can enjoy the Games Lounge which is an intimate space for entertaining and will include a foosball table and television. The Peak at SFU condos will also feature The Conservatory which is an active study and meeting place for groups. The Screening Room is an acoustically optimized theatre. The Peak at SFU condo homes are intelligently designed with distinguished architecture and over 10,000 square feet of amenities. These 1, 2 & 3 bedroom concrete view residences offer the most incredible panoramic views in the province. Intergulf has a long history of successful development at SFU’s UniverCity, starting with the pioneering Novo residences in 2004. Led by our innovative Intergulf Intelligence philosophy, our approach emphasizes thoughtful planning – from identifying the location, to executing every last detail with the highest standards of quality and craftsmanship. COMING EARLY 2016. The presentation centre is located at 8955 University High Street Burnaby. They are open 12-5pm every day and closed Fridays. The project is designed and built by Intergulf Developments. Positioned on the most coveted parcel of land at UniverCity in the established West Highlands neighbourhood at SFU – Canada’s #1 comprehensive university – The Peak offers the most incredible panoramic views in the province at the best value. All homes include at least 1 parking stall and 1 storage locker.